Kalives for quiet relaxing holidays in Crete, Greece. 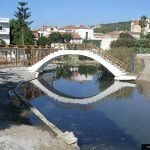 Kalives is just 4 km away from the village of Almeritha and they are not so different, definitely the town of Kalives is much larger in scale, and attracts its fair share of tourists throughout the summer. 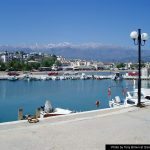 The town is split by a small river running through it, and it also has two main beaches from which you can take your pick. Kalives is the perfect holiday destination if you want to step off the plane, jump in your car hire or taxi and be in resort quickly. 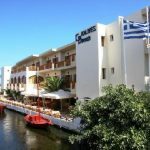 It is just 20kms from Chania and the airport, its a very family friendly resort with some nice self catering hotels and there’s so much to do and see in the area. The beaches of Kalives are nice and sandy and the beach gently shelves into the sea, the harbour area is ideal for fishing, so remember to take your fishing rods. There are boat trips going daily from Kalives to the likes of Balos and the surrounding areas. 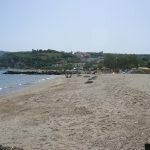 If your looking for a relaxing beach holiday then Kalives has it all, the beaches are well maintained by the locals, with sunbeds and umbrellas available at a small local charge. Both of Kalives’ beaches have a beach bar or two where you can get chilled drinks and some nice snacks to see you through the day. Moving onto the evening the small town comes alive with the smells of home cooked Cretan cuisine, the Taverna’s on the river and seafront are some of the best in Crete, with dishes like Moussaka, slow cooked Stifado and Kleftiko lamb, as well as some excellent fish dishes, they are a treat for the senses. 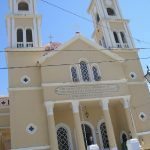 A must see is the church in Kalives, it has some of the best painted frescos and murals I have seen to date, with a huge painting of Christ within the domed roof surrounded by angels and saints; it has to be seen to be believed. After eating there are a number of bars which you can sit back in and get some great cocktails or local wines, chatting with the bar owners and listening to excellent live Greek music. 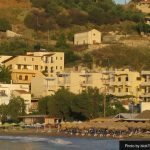 For the more party orientated people there is normally a disco throughout the summer months, but if you’re hankering for more you must visit Chania or Platanias which are both a taxi ride away. 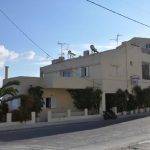 Positioned just off Chania and Souda bay there is so much to explore here, you can take a trip to the natural harbour of Souda, or the stunning Akrotiri peninsula. There is mountain biking on offer with cycles and guides provided to help you explore the rugged coastline and white mountains. If you want to go on boat trips you can visit the stunning Gramavoussa peninsula and the Balos beach, one of the most photographed beaches in the world. If you want to get out and explore the West of Crete its highly recommended to get car hire booked before you travel.